27% of business outages are caused by water intrusion caused by A/C line breaks, roof and/or other building leaks, faulty sprinklers, backed up drains, etc. Dollar losses tend to be extremely large. 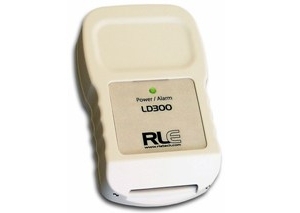 RLE Leak Detection Systems continuously monitor underfloor areas for water that can cause damage. Typical applications include use under raised computer room floors, ceilings drip pans, and other critical building locations. The versatile sensing cable can be routed in a variety of patterns to meet individual requirements. The cable can also be routed along chilled water lines, around ducting, and through pipe chases. 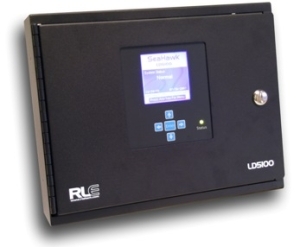 RLE’s SeaHawk™ LD5100 detects and reports the presence and the exact location of water and other conductive liquids. When a conductive liquid comes in contact with RLE’s patented water detection cable, the system pinpoints the location of the leak. Within seconds, the system’s alarm sounds and the distance to the leak is shown on the liquid crystal display (LCD). The operator then cross-references this distance with the cable route map and quickly locates the water problem. The LD5100 enables the protection of large critical spaces against costly water damage and power outages, thereby helping to improve the uptime of critical equipment and services. RLE’s SeaHawk™ LD2000 detects and reports the presence and the exact location of water and other conductive liquids. When a conductive liquid comes in contact with the leak detection cable, within seconds the LD2000’s LED flashes in alarm, and the display LED provides a distance measurement. The physical location of the leak can then be determined by cross-referencing the displayed distance with a cable reference map. This robust system is the most cost-effective distance read panel on the market. No other distance read system in the world is web-accessible, integration friendly, and/or provides direct notification. The SeaHawk LD1000 is a zone detection product that provides additional flexibility to detect and report the presence of water and any conductive liquids along the length of SeaHawk leak detection cable. 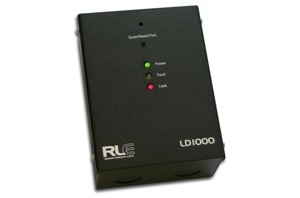 When a water leak or the presence of any conductive fluid is detected, the LD1000 control panel visibly and audibly annunciates the leak, and indicates in which zone the leak is located. The audible alarm is user configurable for audible or non-audible. Cable trouble alert and sensitivity adjustments are standard features which help eliminate false alarms. The SeaHawk LD300 is a single zone system that detects and reports the presence of water and any conductive liquid along the length of RLE patented cable. The SeaHawk LD300 is ideal for smaller areas that require leak detection monitoring. 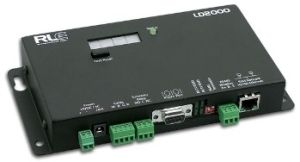 With a visual alarm indicator and two output relays for leak and fault, the LD300 monitors up to 300 feet (91 meters) of SC cable, which is often encircled around critical equipment. RLE’s patented SeaHawk™ water leak detection cable reliably senses any conductive fluid. The unique design helps eliminate false alarms, dries quickly, resists bends and kinks, and lies flat after installation. Leak detection cable is sold in 25, 50, and 100 foot sections with the end connectors installed. This modular design allows existing cables to be expanded in the field by simply connecting additional lengths. Mating connectors make installation and replacement of damaged cable quick and easy. RLE’s SeaHawk™ Spot Water Leak Detection products (SD series) provide the most cost-effective way to report the presence of water and any other conductive liquid at a single point. They are commonly used to identify water in a contained area, such as small rooms, air conditioning drip pans, and around floor drains.